Not just delicious, but perfectly practical: A grilled sausage tucked in a soft bun is a portable savory snack that’s easy to enjoy as you browse through stalls of handicrafts. 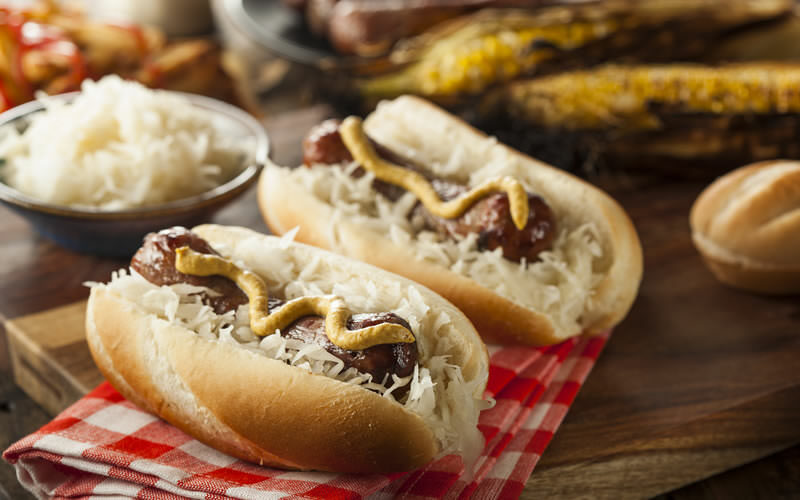 Bratwurst, a lightly spiced pork sausage, is the most traditional of the German-style sausages, but you can also try blutwurst (blood sausage), weisswurt (veal-based white sausage), käsewurst (cheese sausage), currywurst or, of course, a classic frankfurter. Best enjoyed on a toasted white bun with brown mustard and grilled onions. It’s chilly out there, so get yourself a paper cone filled with roasted chestnuts and warm your mitts as you inhale their intoxicating aroma. Roasting brings out the sweetness of the nuts, which have a tender flesh that also happens to be loaded with vitamins and minerals (so you can convince yourself it’s health food). 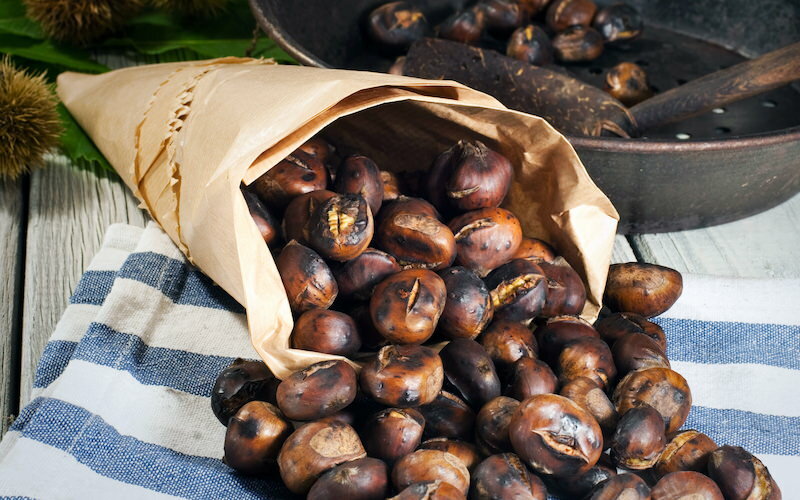 Roasted chestnuts have been a traditional winter food for centuries, a delicious way to use the fires that have been lit to warm the house. 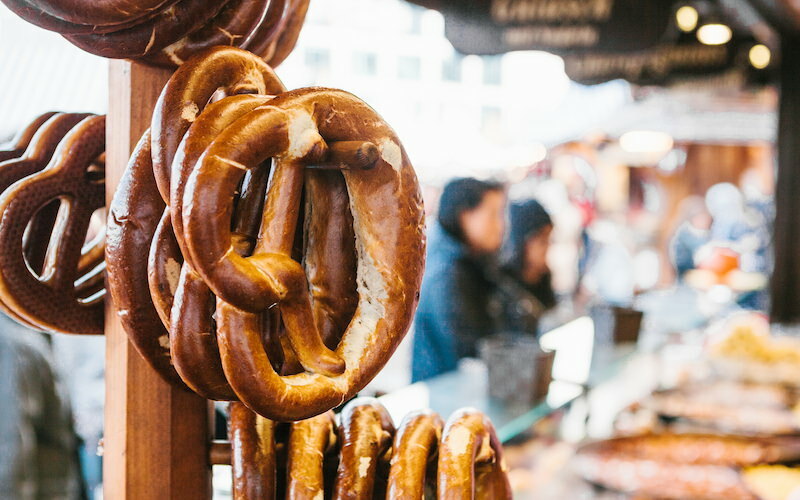 Satisfyingly twisty, with their firm crust, tender interior and dusting of crunchy salt, traditional German-style pretzels are always a Christmas fair favorite. You may know them best as a half-time snack at your favorite sporting venue, but they actually have religious significance, or did, once upon a time. It’s believed they were first created by monks in the early Middle Ages, possibly in Italy or France, though they have been associated with Germany since at least the eighth Century. The three holes represent the Holy Trinity, while the knot shape mimics hands in prayer. One potato, two potato, more, more, more! 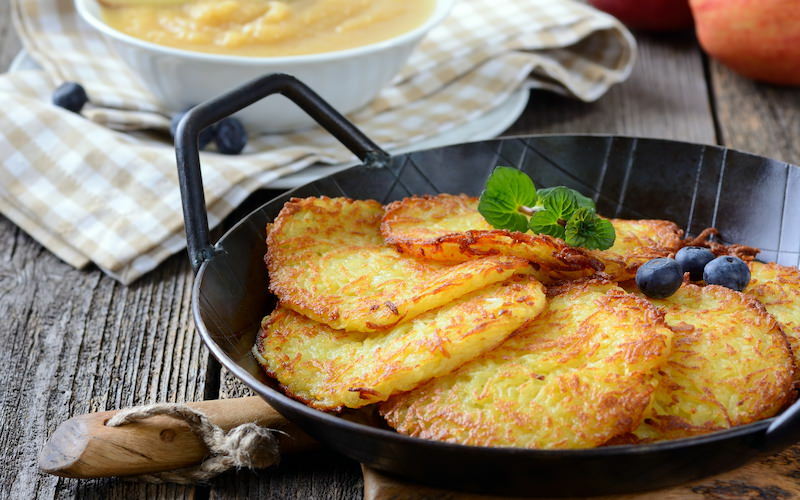 The German potato pancakes known as Kartoffelpuffer are not only fun to say, they are utterly irresistible. Similar to latkes, they are made from lightly seasoned grated potatoes that are formed into patties, fried until crispy and served with a variety of toppings, such as applesauce, honey, or sour cream. Then again, if you prefer sweet to savory, you may prefer to indulge in the mounds of what look like tiny raw potatoes – but are actually made from sweet marzipan. Who can resist gloriously melty cheese? Even better than fondue is raclette, which originated in the Swiss Alps and has become a festive favorite far and wide. 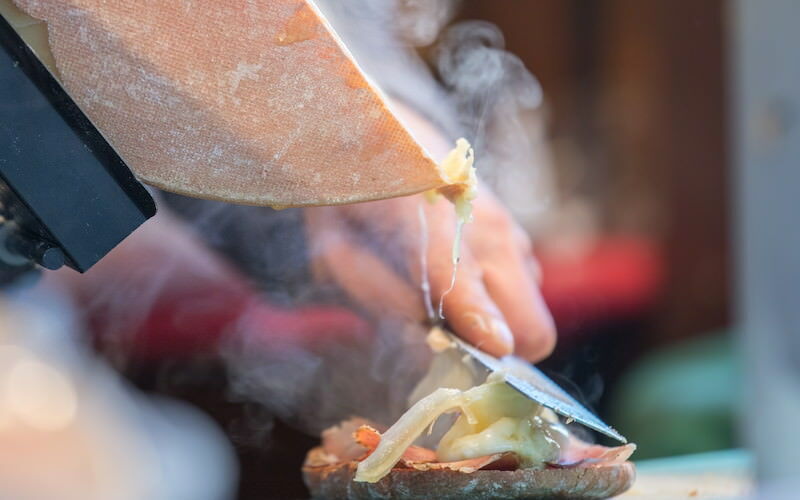 Raclette is both the name of a cow milk semi-hard cheese that’s fashioned into a wheel, and the dish made with it. One side of the cheese faces a searing open flame, which gradually melts the cheese. Its molten layers are then scraped on top of boiled potatoes, pickles, vegetables and cured meats such as ham or sausage. The name comes from the French word ‘racler’, to scrape, but we just think it means ‘delicious’. Ginger, cinnamon, nutmeg, allspice, cloves. These warm spices are the flavor of the holidays – especially in the classic gingerbread cookies to be found at Christmas markets. 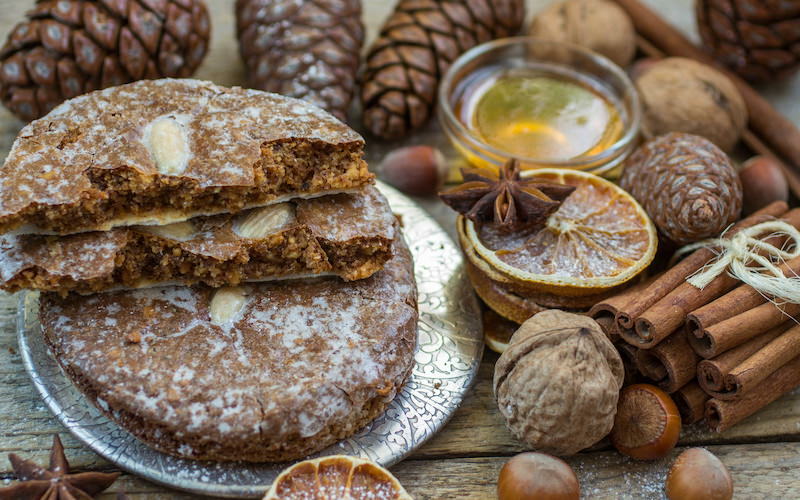 Known as ‘lebkuchen’ in Germany and Austria, they are typically made from a slightly sweet spiced dough, sometime sweetened with honey, and often flavored with nuts and candied citrus peel. Rather than the simple gingerbread men of North American tradition, these are shaped like hearts, stars, rounds or bars, and can be beautifully decorated with ornately patterned royal icing. 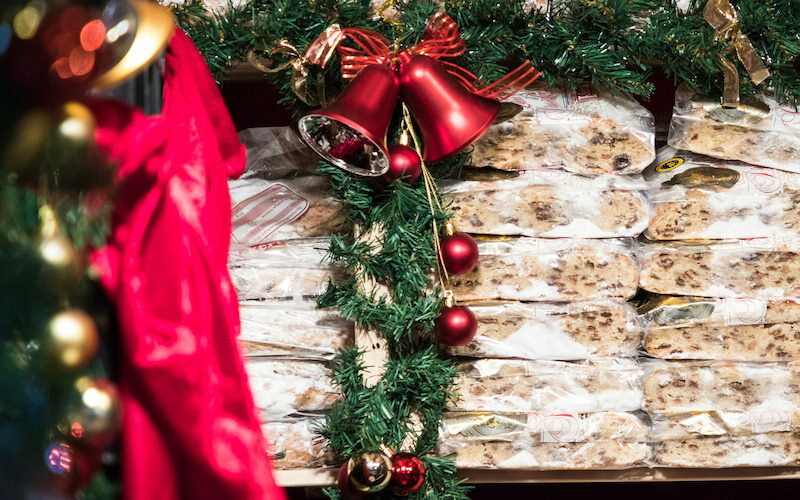 Even fruitcake naysayers love stollen. And what’s not to love? Stollen is not actually a cake, but a sweetened bread that when sliced, lightly toasted and slathered in butter, makes a terrific holiday breakfast. The dough is generously studded with candied citrus peel, dried fruit, nuts and spices, and the most indulgent versions have a rich marzipan core. The loaf is baked, then dusted with a thick layer of icing sugar, the whole said to represent the baby Jesus wrapped in swaddling clothes. Originally a street snack from Hungary, the chimney cake is a dramatic treat that’s been spotted at Christmas markets throughout Europe. A bread-like dough is wrapped in a tight spiral pattern around a spit, then held above an open flame, turned and turned until it’s baked golden and fragrant all around. 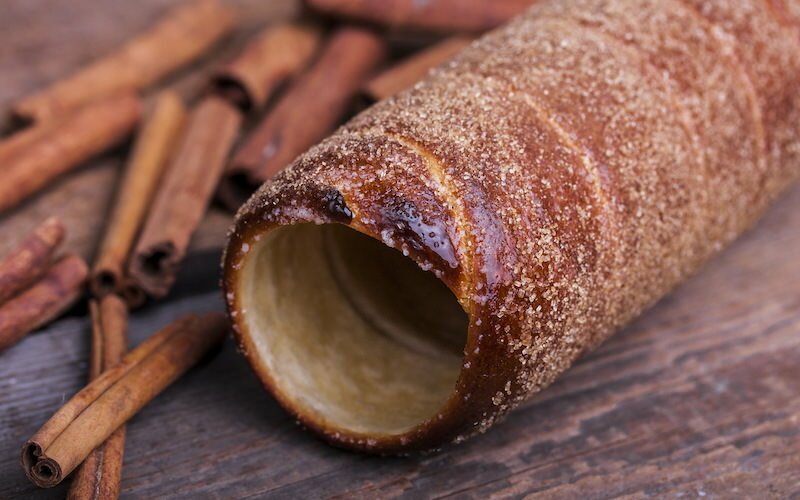 The hot, hollow tube – which looks like a chimney, hence the name – is then quickly rolled in sweet toppings that can include sugar, cinnamon, cocoa, ground walnuts or almonds. These snacks are sweet and crunchy on the outside, soft and fluffy on the inside, and utterly addictive. 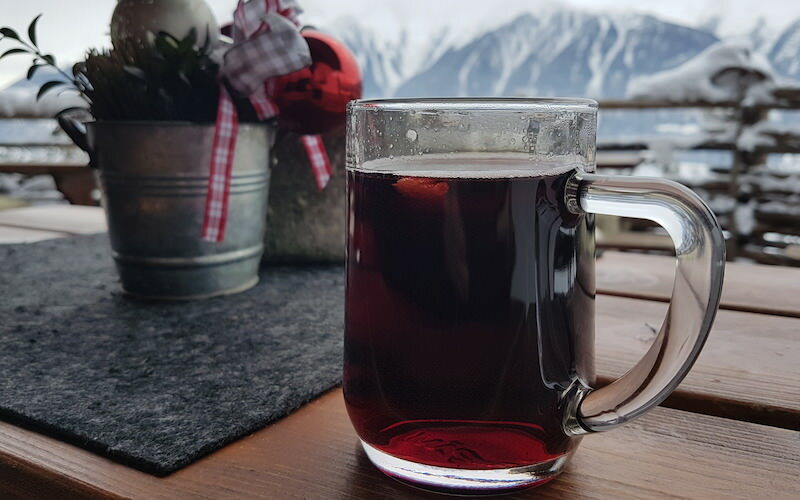 There is perhaps no more ubiquitous Christmas market tradition than enjoying a steaming mug of the hot spiced wine known as glühwein. Red wine mulled with cinnamon, cloves, lemon, sugar and perhaps a dash of rum or brandy, glühwein is usually served in festively decorated ceramic mugs that you can keep (or return for a deposit). 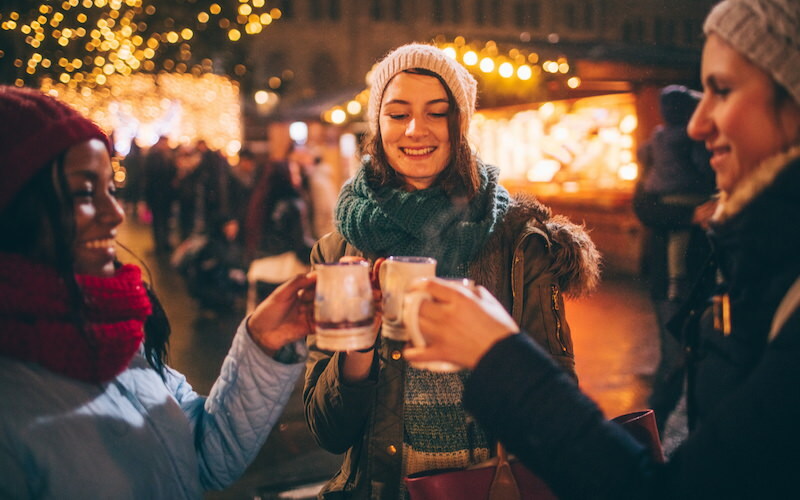 The hot wine has the added benefit of keeping you warm and happy while perusing the craft stalls, and there are even nonalcoholic versions for the little ones. Then again, there’s only so much sweet wine a person can take. Fortunately, most markets offer plenty of other libatious options. Among them are a variety of punches: Austrian rum punch, for instance, or the creamy Eierpunsch made with egg yolks and white wine, or the Feuerzangenbowle, in which a sugar loaf is soaked in spirits then set ablaze so the caramelized liquor drips into a bowl of red wine. There are alcohol-free fruit punches, too, as well as hot chocolate and herbal tea for those who choose not to imbibe, and beer or hot cider for those keeping it light.